THE ENTERPRISE AND REGULATORY REFORM ACT HAS REVERSED THE NORMAL WORKINGS OF COPYRIGHT. image © 2013 Jason Brown. Please feel free to copy and redistribute this image. Normal copyright law as agreed in international copyright treaties, to which the UK is signatory, grants copyright owners 'the exclusive right of authorizing the reproduction of [their] works, in any manner or form.' Creators don’t have to apply for this right: it is theirs automatically and without formality. This means that unless it is used under one of the narrowly-defined Fair Dealing exceptions to copyright allowed by these treaties, it is illegal to exploit a copyright work without the permission of its owner. The EAA Act changes that. 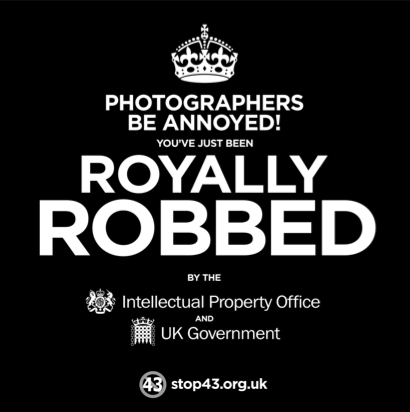 Under its provisions it will be legal to exploit a copyright work - photograph, film, text, song, whatever - without the knowledge, permission of, and payment to, its owner. Why has this happened? The full story will have to wait for a later article, but here it is sufficient to examine three statements made by the Government and reported by the BBC. Yes, if by 'efficient' you mean 'no longer having to find, get permission from, and pay property owners before exploiting their property'. For almost any other kind of property, this idea would be outrageous. Imagine if this applied to cars, houses or bank accounts. As we have said earlier, international copyright treaties grant copyright owners 'the exclusive right of authorizing the reproduction of [their] works, in any manner or form.' If this is an 'unnecessary barrier to the legitimate use of works', quite how are 'the interests of rights holders' being preserved by breaking it? The legitimate interests of foreign rights owners are certainly damaged and their rights breached by this Act. Correct. We didn’t say they did. However, the powers breach copyright owners' exclusive right of authorizing the reproduction of [their] works, because it will be legal to exploit copyright works without their owners' knowledge, permission, and payment to them. The practical result is that the works will remain in copyright but no longer enjoy the protection of copyright, because their owners can no longer exclusively authorise their reproduction. And so, for these works, ‘copyright’ becomes worthless and meaningless. Whose permission? Not the copyright owner's. Who will be paid? Not the copyright owner, because by definition for an orphan work he cannot be found. The copyright owner will get no benefit whatsoever from the commercial exploitation of his work; work which is often made with great skill and at considerable difficulty and cost, in order to generate licensing income for its creator. Some people complain that many orphan works were never made with commerce in mind, and because of that they ought to be free to exploit. This is a nonsense. If a work has sufficient value to make it exploitable, its owner ought to enjoy a fair whack of the proceeds as is his right under international law. If that work becomes newsworthy and of great value to media organisations (or advertising companies masquerading as tech companies and social media) it becomes a 'lottery winner'. Why should the creator of the winning lottery ticket not collect his prize? He does in other lotteries. Legalised copyright infringement schemes enabled under the ERR Act will not come into force until the regulations controlling them are enacted some time before the end of this year, and so direct action is still worthwhile. It would be useful to let the Minister for Intellectual Property, Viscount Younger of Leckie, know what you think. Other Parliamentarians and your local MP might also like to know your thoughts. Here you will find short articles and links to source material. •	What is a "Diligent Search"? •	Misplaced faith in "Consultation"